A couple of years ago, Alan Rickman watched as Jimmy Fallon and Benedict Cumberbatch got up to shenanigans in a so-called “Rickman-off,” in which both took turns doing impressions of the famous actor. Last night, Rickman actually appeared on The Tonight Show starring Jimmy Fallon and got some revenge in the form of helium. Check out the amusing video, below. Alan Rickman’s a man who is well aware of the impressions people do of him, and has personally encountered Fallon’s own sketch poking fun at his manner of speaking. So, he brought some helium as a proper “truth teller,” which basically gave him the satisfaction of watching Fallon make a goof of himself on late night television, just as Fallon made a goof of him a couple of years ago. Fallon, luckily, doesn’t mind humorous revenge plots, sucking in the helium and apologizing to the Harry Potter franchise actor, who eventually joins him in the helium fun. Plus, balloons! 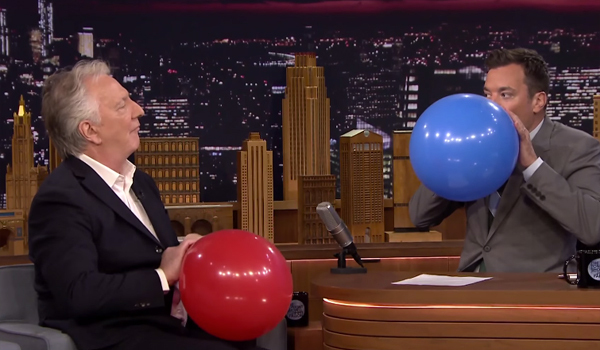 It’s probably hard to understand why Rickman would bring his own helium to the set of The Tonight Show if you haven’t caught the original Rickman-off. That bit featured Fallon and Cumberbatch reading famous rap lyrics while doing Alan Rickman impressions. Yes, that includes somewhat undignified lines like, “I like big butts.” Give it a watch, right now, because it’s excellent. While Jimmy Fallon has gotten better at interviewing over time, he’s made a career out of being approachable and playing fun games with celebrities, and while I would never have guessed that watching two gents sucking on helium and saying silly things would provide a whopping 2 minutes of entertainment, I’m pretty happy it happened. Now just give me Alan Rickman in a lip sync battle and I’ll die a happy woman. You can catch Jimmy Fallon getting up to other antics such as these on weeknights at 11:35 p.m. ET, only on NBC. In addition, here’s everything else that’s hitting the schedule this summer.